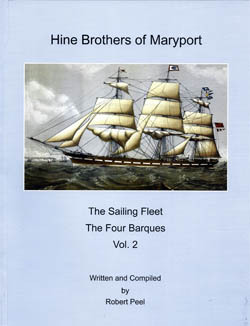 Hine Brothers of Maryport: the Sailing Fleet: The Four Barques Vol.2 written and compiled by Robert Peel. £25. Alfred Hind commenced business as a shipbroker in Maryport in 1869. Four years later, his elder brother, Wilfrid, who had a shipowning business in Liverpool, joined him to create the firm of Hine Brothers on 1st July, 1873. Their "Holme Line Fleet consisted of over a dozen steamers and half-a-dozen sailing vessels, and they traded with all parts of the world, particularly South Australia." Even though their ships sailed out of London, the business was a boon to Maryport. They brought trade to the town and the ships were manned by Maryport men. In this second volume, Robert Peel pieces together the stories of the firm's four sailing barques, Eden Holme, Brier Holme, Myrtle Holme and Castle Holme. As they made their great voyages around the Cape of Good Hope and through the Roaring Forties for three decades they carried the hopes and fears of many families in Maryport. The Eden Holme under Captain Randall left London on June 18th, 1877. They crossed the equator after 35 days and rounded the Cape, "with thick weather" on August 17th. With fresh gales from the west, the ship had reached Tasmania within another thirty days. On September 21st, "the ship was struck with a terrific squall from west-north-west, splitting foresail and jibs, and blew topgallant sails away from the bolt ropes, and ship lying with lee-rail in the water, the storm attended with lightning and thunder, heavy hail and rain." The Eden Holme "anchored at the Yellow Patch on September 28, making the passage from London in 102 days." In 1905, the Brier Holme was less fortunate. On November 5th it was off the coast of Tasmania, 102 days out from London. The weather was thick and the vessel reefed down. "Somewhere near midnight the ship's company was startled by the vessel suddenly striking a reef close in shore on a rocky and inhospitable coast, and a loud explosion of the dynamite which was in the after hold followed, blowing the after deck up. The watch, consisting of the mate, four sailors and three apprentices, together with the captain, who was doubtless in his cabin, probably asleep, were hurled into eternity without a moment's warning." The surviving sailors clung desperately to the wreckage, but, battered by the storm, only one survived to tell the tale. The Hine Brothers was a great commercial success and they became pillars of the Maryport community. However, much of their business was in sail. When the Suez Canal shortened the route to Australia for steamships, sailing ships still had to brave the stormy capes. Those slim, fleet barques with their acres of sail were a thing of the past. Robert Peel, who claims lineal descent from Prime Minister Robert Peel, and from William Shakespeare, has compiled a vast and romantic archive on the Hine Brothers. He chooses to present not a continuous, connected narrative, but assembles ships logs, harbour reports, newspaper articles and a host of other material. It represents a wealth of documentation. The enthusiast can trace the voyages of each of the four barques and learn a great deal of the history of sea-faring at the end of the nineteenth century. It is a book in which anybody with a romantic attachment to the great days of sail and the great days of Maryport can explore the lives and voyages of the Cumbrian men who risked their lives to sail around the world.